OK - I have to share with you a dream that I had... I dont know what it means - but it was SOOO vivid. 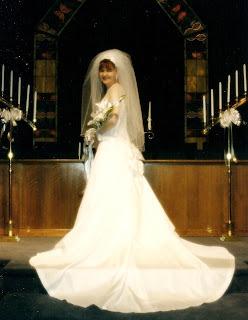 It started with me in my wedding dress & the day I got married. It was like a Christmas Carol moment, where I was back in time, watching myself from a distance - like the Ghost of Weddings Past took me back in time. There I was, young (& skinny) & in my great, awesome, wonderful dress... & I was watching myself at my wedding - enjoying the moment, enjoying the people around me, just enjoying the day. Wow...just..wow! What an incredible dream. I love dreams like that and I'm glad you blogged about it. I've always wished I could chronicle my dreams, because I know I could get something out of them. Then again, some of them come from eating pizza right before bedtime. LOL. The worst one ever was when I dreamed my mom died. I vividly remember seeing her funeral and realizing I'd never see her again. I woke up screaming with tears streaming down my face. Sometimes I think those dreams are messages from God telling us to not take anything or anyone for granted. Thanks for sharing your dream with us! Wow!! I have never had a dream like that. Amazing!! WOW! That's pretty amazing! I can never even remember my dreams after I have been awake for a few minutes. That is one amazing dream! What did you eat before you went to bed? That's really neat. I have no idea what it means, though! What a beautiful wedding picture. Huh? That is pretty wild there girl! No more chips and salsa for you! No regrets is a good moto to live by, that is for sure! Maybe it was a way to say that God wants you to live every stage of your life with no regrets!! Serve Him with all you've got!! Maybe? Wow! Thats a crazy/neat dream!! So impressed that you remember it so vividly - and I'm glad you blogged about it so now you have it in wirting! Dreams are the most intense and unusual experiences! Whoa! That's one of those dreams who can really spook yourself over if you let your 'awake' imagination try to interpret it! The crazy ones are the ones you remember - never the bazillion of ho hum & nice happy ones. What did you eat yesterday? What did you drink? Did you take any new medicine or cold medicine? That's the first place I think back to. No matter what, I think the message of no regrets is key for any and every one of us. Keep us posted if you learn anything more. Oh, you asked a while back about Mush Burgers. It's similar to a sloppy Joe only you use ground beef or turkey, diced onions, cream of mushroom soup, Katchup and mustard about 1/4 C of each. Add it to a burger bun or dip with corn chips is good too. Great when you're looking for a cheap meal w/few ingredients. Let me know what you think. It's not really pretty to look at but it's good! One of my mom's recipes from our tight budget days. So vivid! Do you have any idea what it could possibly mean? That's a very cool dream! That's neat - but I had a dream about you guys this weekend. I helped you move to a waterside house. We had to throw boxes into a boat to transport to your new house! Interesting about the things that we dream and the meanings behind them. I sure have some weird ones.